Have a question for Rock View Lodge? "The location was very near to the restaurants, souvenir shops and especially to the port." "It is located along the main road, Rizal street and only 5 mins walk from the port and beach." "The place is just 3-5 chill walking to the beach and the por..."
Whether you're a tourist or traveling on business, Rock View Lodge is a great choice for accommodation when visiting Palawan. The excitement of the city center is only 17.3 km away. With its convenient location, the hotel offers easy access to the city's must-see destinations. The facilities and services provided by Rock View Lodge ensure a pleasant stay for guests. Guests of the hotel can enjoy on-site features like free Wi-Fi in all rooms, room service, tours, laundry service. All guest accommodations feature thoughtful amenities to ensure an unparalleled sense of comfort. Besides, the hotel's host of recreational offerings ensures you have plenty to do during your stay. Whatever your reason for visiting Palawan, the Rock View Lodge is the perfect venue for an exhilarating and exciting break away. "The staff was very accomodating." 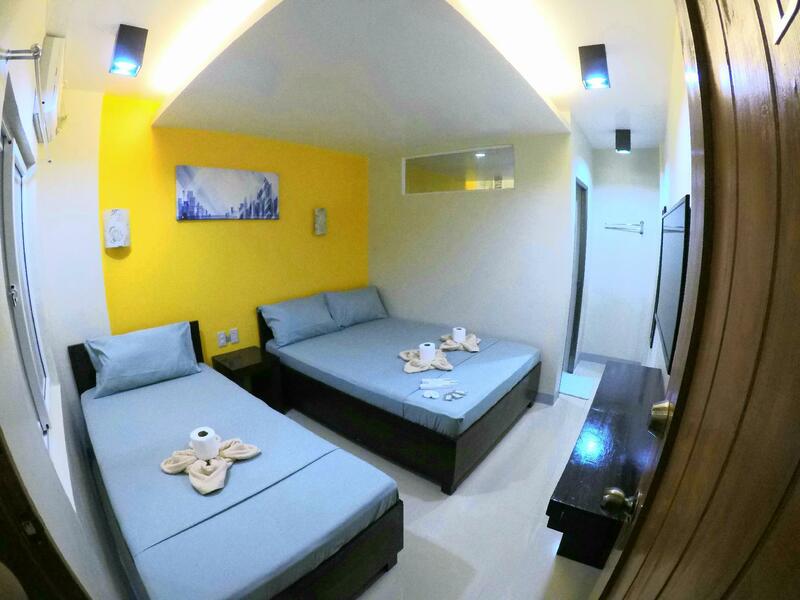 This is one of the cheapest accommodation in town and yet very comfortable and convenient. It is located along the main road, Rizal street and only 5 mins walk from the port and beach. Food, bars, tour offices are just nearby. Surprisingly, the rooms are very tidy and clean. The aircon is very cold and there is wifi. The bathroom is also very clean. There is also a convenient store infront which is also owned by the homestay owner. I would surely recommend this homestay for those who are looking for a cheap but worthy accommodation in El Nido. I was booked here in late July 2018. When we arrived in El Nido, the rain was non-stop and the streets were flooded. Floodwater definitely went inside the room, and the owner immediately transferred us to another hotel. Overall it was still a great experience. The people are very accomodating. The place would be reallg great since its so close to the beach, restaus and bars. Would definitely book again, but never again on monsoon season. The staff was very accomodating. The location was very near to the restaurants, souvenir shops and especially to the port. Bed and comfort room were very clean. Disadvantage was you can see a few insects around the area but I think that’s normal because it’s rainy season tho. Good location. really want to appreciate staff (care taker -lady), forgot the name, she helped us so much, big thanks to her. Also I really want to thank owner who helped us to cancel the room on 2nd day, even at the last movement. They really not into for money. Good work, appreciate it. Stayed here for 4 nights and it was great. The location was at the center of town. It was near the bakery and restaurants. Walking distance from everything. The room was small but it’s well maintained. Nice restroom and the aircon was working too. But i just wished they had a cabinet for clothes. They just have one table inside the room. They have thin wall division so be sure to be quiet! They also offer free coffee and hot water every morning. We checked out by just leaving the keys inside the room. The hotel staff were missing when we left town. Overall : if you’re just staying in el nido for island hopping this is a good option. It’s cheap! My family stay here for two nights,Its a nice place,the room was very clean,staff were very helpful attending our needs and organising tours,3 to 5 mins walk to the beach,near to the shop... My son love their store,it just a few steps from our room 😁 Highly recommended and be back soon. Great location on the Main Street, behind a convenience store so everything you need on your door step. Very cheap air con room, clean comfy and tidy. Would definitely recommend! This is a really noisy place. It is located right next to the main road. Walls are really thin so you can hear everything. Almost impossible to sleep, only quiet time is around 4-5am. Roosters start screaming already at 4, but at least no tricycles and other noise. There is no housekeeping and we had red ants in our room. They are probably living in the walls. The place is just 3-5 chill walking to the beach and the port where you'll ride the boat for the tours. no need to ride the tricycle. Same with places where you can eat and dine. Place is cozy. has a clothes rack and hanger where you can let your wet clothes dry. Room has both aircon unit and wall fan, so if gets too cold, you can just use the fan and vice versa, or both, which is great. The owner was awesome, although we only communicated thru text, we were well endorsed to the staff and the tour agency for our tours. very hassle free. The staff needs to be more attentive with the regular needs (e.g. refreshing of trash bags, hot water for coffee, and towels). other than that, it is a great place to stay. Very clean and comfortable room with a big bed and attached bathroom. Towels, soap and shampoo were provided. Staff were very helpful in organising tours and answering questions. Walking distance to the beach, shops and restaurants/ bars. No noise disturbance at night. On the downside, Wi-fi was very poor and the big bed took up quite a lot of space in the room. No in-house laundry service but that's not a big problem as it can be found nearby. The room can get hot and stuffy, so make sure to leave your windows open during the day to allow some ventilation if you don't book a room with a/c. Overall, we were happy with our stay here. Owners were very approachable, helpful and trustworthy. 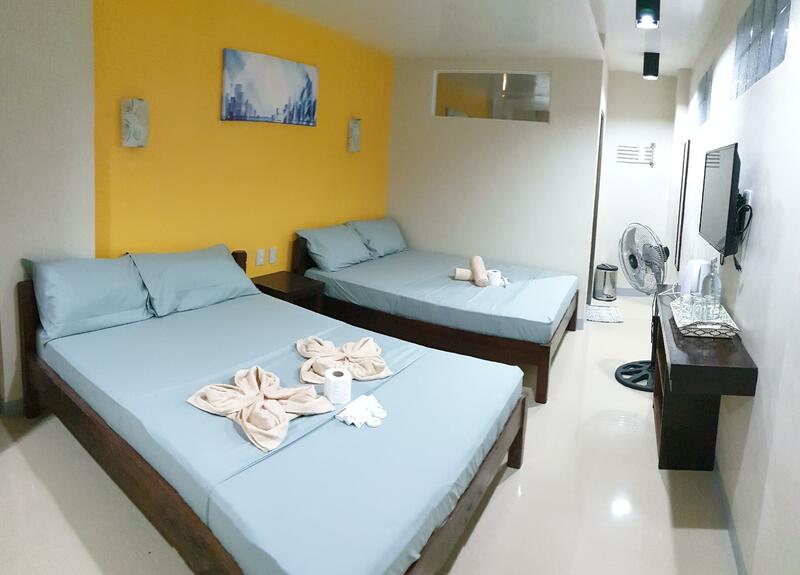 Place is at the heart of El Nido town, walking distance from the beach, near a drugstore and massage parlor. Got an aircon + fan room. Very neat place, no bugs but be prepared to use mosquito repellent. Good for a few days stay. In the town proper so no worries when it comes to food, transportation and activities. The thing is the comfort room should be fixed. There is a bad smell coming out from the sewages. Might be dirt that got stuck. Nonetheless, we enjoyed our stay! I stayed here because the price was good but i should have gone to another hotel. sorry i will not be returning intill the down side is gone. the up side -is that the ac works well when the power is on -coffee in the morning -good location (the beach is close, food is every where, only bread place in town is a block away go to it) The down side is to much. -Wifi is a pocket wifi. it cant handle more then 2 connections at a time (get you own with globe its only 200p for 5 day) -Brown water that never stops being brown -sheets with brown stains that could be from any thing (eather blood or rusted metal). i asked for new sheets and i got new sheets with more stains. The lodge is on the main street and away from any pubs/clubs. However,you will get woken up by the tricycles passing the road early (5am ish) if you are a light sleeper like myself. Also there is this rooster that likes to hear his own echo (by crowing at the cliff behind the lodge) during 1 or 2am and from 4 or 5 am onwards. Not really the hotel fault, I think you can't avoid this unless you stay on the beach front hotel. I very much enjoyed my stay at Rock View Lodge. 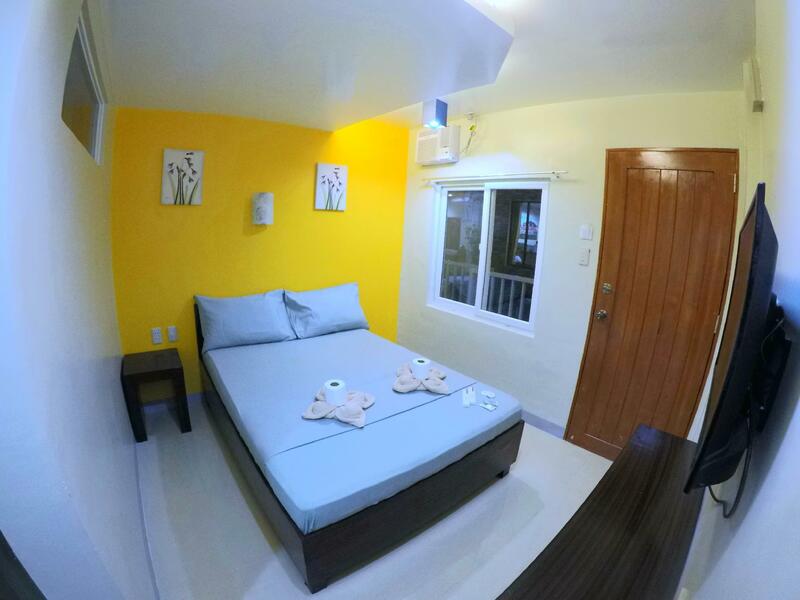 It has a great location right on the strip in El Nido town proper. Close to the restaurants and tour groups. They can easily get you set up with a scooter to rent or a bus ticket. The owners were so kind and warm, they made me feel so welcomed. Would stay again if I visited El Nido.